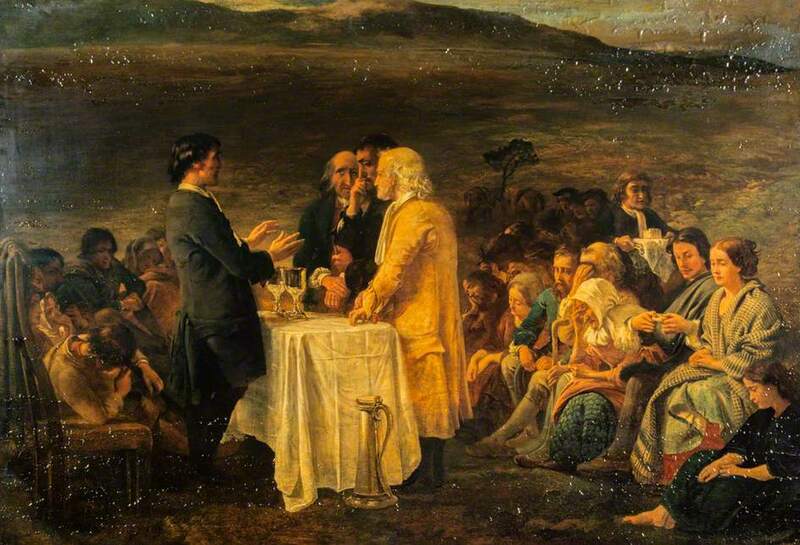 …in the year 1742, there was an extraordinary religious awakening in the West of Scotland. It began in Cambuslang, a parish on the Clyde, near Glasgow, There were not over nine hundred souls in the parish, yet out of that number about five hundred were, it was believed, converted. The awakening in Cambuslang was preceded by a year’s faithful preaching of regeneration and the atonement by the pastor, Rev. John M’Culloch. 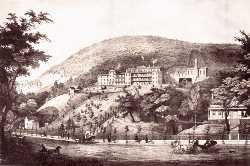 Who then for twelve weeks came daily preaching –generally out-door or in tents. Whitefield (then in the zenith of his power and popularity) came to Cambuslang, and delivered a dozen discourses. This “Son of Thunder” never stayed long in one spot; as he used to say, ” More than two weeks in one place kills me as dead as a door-nail.” But his two visits to the rural parish near Glasgow were inundations of blessings to the thirsting multitudes. Mighty audiences from Glasgow and Western Scotland thronged to hear him. Whitefield frequently addressed 20,000 souls in a day! At the first communion season after his visit, no less than seventeen hundred persons sat down to the tables, which were spread under tents. A few weeks after, the Lord’s Supper was dispensed again; and probably it was the most extraordinary communion service ever witnessed on earth. No less than forty thousand people gathered to witness the solemnities. Preaching went on for several days previous under Whitefield and others; but on the second Sabbath in August, the Pentecostal scene culminated. The day was mild and genial, the air fragrant with the breath of new mowed hay, and the fields yellow with the wheat-harvest. At half-past eight on that memorable Sabbath morning, the “action sermon” was preached. Then came the “fencing the tables;” * then, immediately after this, the table was spread, and the first company passed into the Lord’s Supper. During the whole day the sacred service went forward; no less than twenty-four companies of over one hundred, each sitting down in rotation! The whole number who partook of the sacred emblems was about three thousand. Such a revival could not be without abiding fruits. Accordingly, we are told that after the close of the extraordinary meetings, the morals of the whole neighborhood were changed. Profanity became almost unknown. God’s day was honoured in every dwelling. 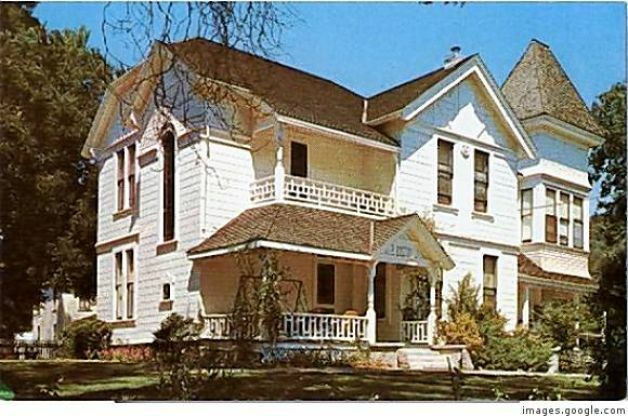 Nearly every house became a house of prayer. Evil speaking ceased. Old enmities and family feuds were forgotten. Every father was a kinder parent; every child more dutiful. Religion went into men’s daily business as a controlling principle; skeptics owned its power, and scoffers were silenced before the beauty and majesty of daily godliness. May He who holds the seven stars in His right hand renew such a period! * “fencing the tables” means the special address in the ministration of the Lord’s Supper. This was a term often used among the Scotch Presbyterians. It is a lecture from the minister just before the distribution of the elements, pointing out the character of those who have and of those who have not a right to come to the Lord’s table. It was formerly called “debarrings,” because in it the ministry debarred from the sacrament those who were not supposed to be worthy. 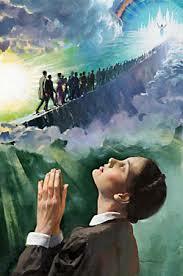 “…shepherd the flock of God among you, exercising oversight not under compulsion, but voluntarily, according to the will of God; and not for sordid gain, but with eagerness…” -1 Peter 5:2 . 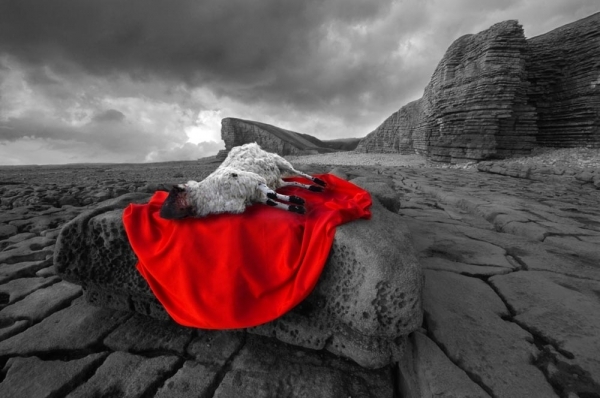 To the Shepherd:”Thou shalt Not Fleece the Sheep!” 1 Peter 5:2 (condensed) . 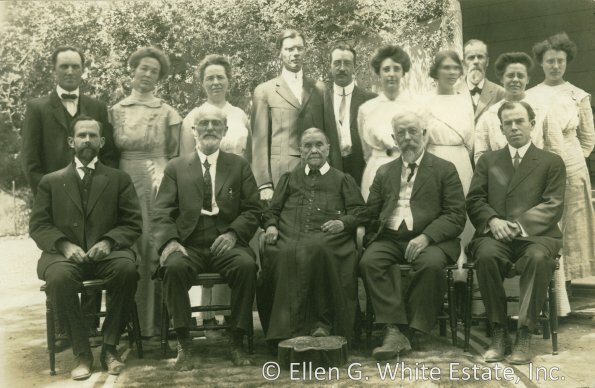 In Part 3, “Ellen White, Seventh-day Adventist’s Prophet for Profit” we looked at some of the more damning financials of Ellen and James White. And I use the term “damning” cautiously here. I do not want to be misunderstood. There is certainly no sin to earn an income, correctly, properly, and within the bounds of Christian propriety. But when we are looking for “wealth” from the ministry of a pastoral office, especially that of a prophetic office, as James indicated; that is for James to direct and encourage an increased writing of “vision” filled literature, on Ellen’s part, indicates an “out-of-bounds,” Christian ethic. However, it does not prove that Ellen White was a false prophet in and of itself, for Balaam himself was also convicted for trying to prophesy for greed. “…having followed the way of Balaam, the son of Beor, who loved the wages of unrighteousness;” 2 Peter 2:15 NASB. 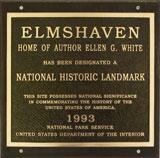 The White’s had both a household and office staff at her Elmshaven estate in 1913. Her large full-time staff consisted mainly of 14 people, which included a personal nurse (Sara McEnterfer), a cook, a copyist, a seamstress, farm hands, several secretaries and various other office assistants and office personnel. Here is the rub. It has not been released as to how many of the staff were actually paid directly by Ellen White. Considering how much it would cost to maintain such a large cadre of people. Salaries alone would have been a fortune. But when you include feeding, equipment, farm supplies, travel expenses; for the Whites were always traveling, as we shall see, then the annual budget most likely would have been a small fortune. It is possible that at least some of the office staff may have been placed on the payroll of the SDA church… After all, for a number of years she was about the only thing that kept the church together (which is the subject of another post). When this church leader, or that church leader would decide that Seventh-day Adventist teachings did not square up with the bible, Ellen White would have another vision… and strangely, it would be about them, some sin that was in their life; some secret sin. Also, she would predict that people would fall away from her teachings, and would therefore go to hell. To say that she singlehandedly kept the church together, and was absolutely necessary for the churches survival is not an understatement. For the young denomination therefore, to pay her to keep her happy and contented, is not outside the pale of logic, or this group’s business ethics (But that is also the subject of another post). Once again, we are indebted to Dirk Anderson for his observations. The following is adapted from his website. 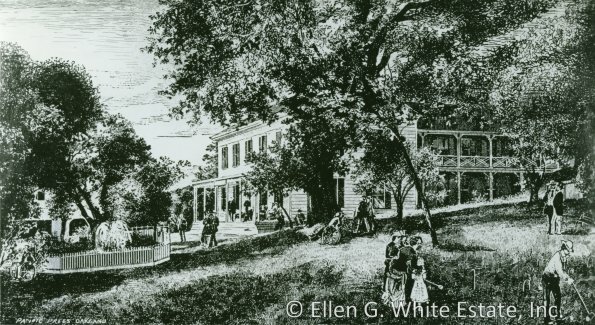 The Whites were frequent visitors to spas and health resorts, such as Our Home on the Hillside, the Dansville Clinic in New York (pictured on the right). Mrs. White also spent time at the Rural Health Retreat in Saint Helena, Dr. Kellogg’s Health Clinic in Battlecreek, and various others health resorts. While criticizing others for wasting their money on photography, the Whites spent freely on photographs at a time when they were quite expensive. A letter written to James in 1876 indicates $500 was spent on one negative. In year 2013 dollars, that is over $10,782.63! Mrs. White apparently had an appetite for fine meats. In 1882, she wrote to daughter-in-law Mary Kelsey White, asking her to purchase some “herrings” and “oysters”. 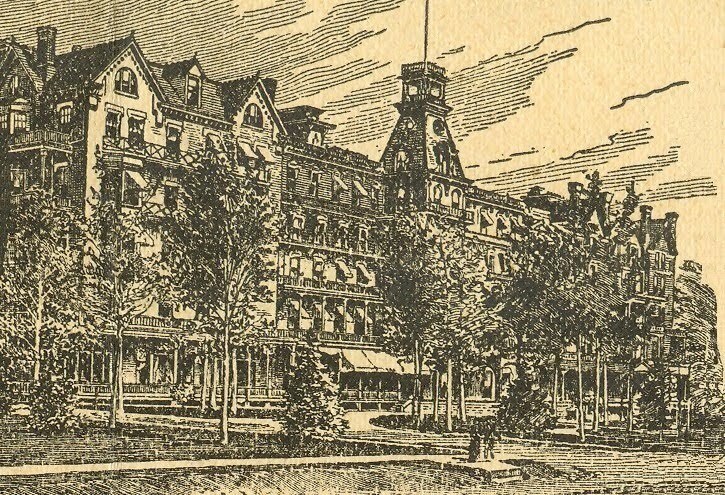 According to Dr. John Kellogg, Mrs. White celebrated her return from Europe in 1887 with “a large baked fish.” When she visited the Battle Creek Sanitarium during the next several years, she “always called for meat and usually fried chicken,” much to the consternation of Kellogg and the cook who were both vegetarians. Mrs. White was a world traveler during an era when world travel was quite expensive. Not only did she travel across the United States, but she also traveled to Europe and Australia, ostensibly to assist with the work in those locations. [The more one reads of Ellen and James White’s life from unsanitized sources, and the more one reads of her writings from the few unsanitized manuscripts obtained from unauthorized sources, the more one is convinced that they are not witnessing a pastoral ministry, much less a prophetic ministry, but rather a machine, or an organization whose mission is to ensure its own survival. An organization which starts off with many more misses than hits, but slowly gains speed as it gains traction. 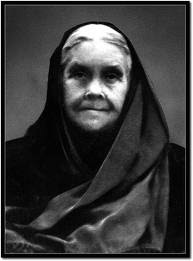 An organization, that owes not its life to the Bible, but to the near single-handed work of Ellen White. An organization that has from the beginning typically destroyed its own wounded. …in the light of the clear biblical record, anyone would have the audacity to suggest that it is wrong for the afflicted in body or soul to couch their prayers for deliverance in terms of “If it be thy will….” We are told that when affliction comes, God always wills healing, that He has nothing to do with suffering, and that all we must do is claim the answer we seek by faith. We are exhorted to claim God’s yes before He speaks it. Away with such distortions of biblical faith! They are conceived in the mind of the Tempter, who would seduce us into exchanging faith for magic. No amount of pious verbiage can transform such falsehood into sound doctrine. We must accept the fact that God sometimes says no. Sometimes He calls us to suffer and die even if we want to claim the contrary. Never did a man pray more earnestly than Christ prayed in Gethsemane. Who will charge Jesus with failure to pray in faith? He put His request before the Father with sweat like blood: “Take this cup away from me.” This prayer was straightforward and without ambiguity—Jesus was crying out for relief. He asked for the horribly bitter cup to be removed. Every ounce of His humanity shrank from the cup. He begged the Father to relieve Him of His duty. The way of suffering was the Father’s plan. It was the Father’s will. The cross was not Satan’s idea. The passion of Christ was not the result of human contingency. 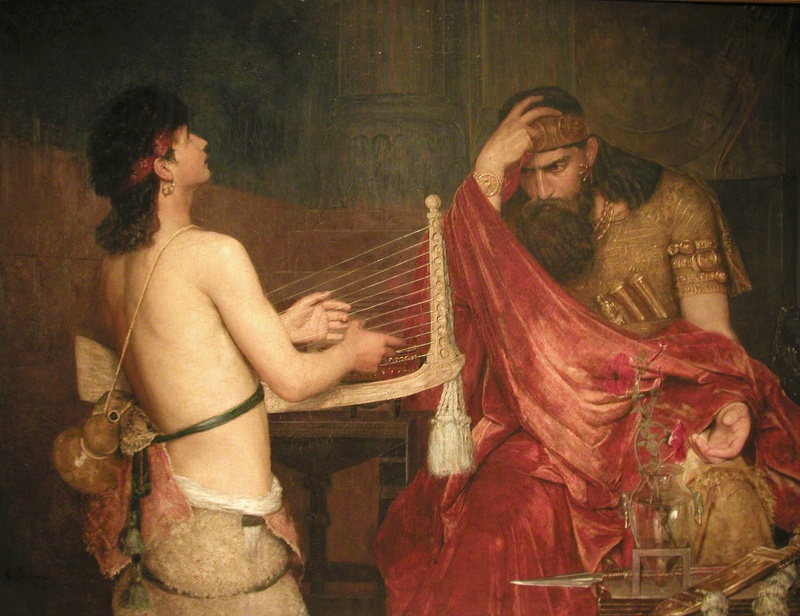 It was not the accidental contrivance of Caiaphas, Herod, or Pilate. The cup was prepared, delivered, and administered by almighty God. In all our prayers, we must let God be God. Jesus qualified His prayer: “If it is Your will….” Jesus did not “name it and claim it.” He knew His Father well enough to understand that it might not be His will to remove the cup. So the story does not end with the words, “And the Father repented of the evil He had planned, removed the cup, and Jesus lived happily ever after.” Such words border on blasphemy. The gospel is not a fairy tale. The Father would not negotiate the cup. Jesus was called to drink it to its last dregs. And He accepted it. “Nevertheless, not My will, but Yours, be done” (Luke 22:42). This “nevertheless” was the supreme prayer of faith. The prayer of faith is not a demand that we place on God. It is not a presumption of a granted request. The authentic prayer of faith is one that models Jesus’ prayer. It is always uttered in a spirit of subordination. In all our prayers, we must let God be God. No one tells the Father what to do, not even the Son. 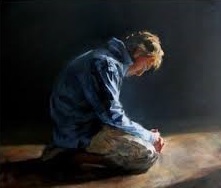 Prayers are always to be requests made in humility and submission to the Father’s will. The prayer of faith is a prayer of trust. The very essence of faith is trust. We trust that God knows what is best. The spirit of trust includes a willingness to do what the Father wants us to do. Christ embodied that kind of trust in Gethsemane. Though the text is not explicit, it is clear that Jesus left the garden with the Father’s answer to His plea. There was no cursing or bitterness. His meat and His drink were to do the Father’s will. Once the Father said no, it was settled. Jesus prepared Himself for the cross. That there is no other way for sinners to be justified from the curse of the law in the sight of God, than by the imputation of that righteousness long ago performed by, and still residing with, the person of Jesus Christ. The terms of this proposition are easy; yet if it will help, I will speak a word or two for explication. 1. By a sinner, I mean one that has transgressed the law; for “sin is the transgression of the law” (1 John 3:4). 2. By the curse of the law, I mean that sentence, judgment, or condemnation which the law pronounces against the transgressor (Gal. 3:10). 3. By justifying righteousness, I mean that which stands in the doing and suffering of Christ when he was in the world (Rom. 5:19). 4. By the residing of this righteousness in Christ’s person, I mean, it still abides with him as to the action, though the benefit is bestowed upon those that are his. 5. By the imputation of it to us, I mean God’s making of it ours by an act of his grace, that we by it might be secured from the curse of the law. 6. When I say there is no other way to be justified, I cast away to that end the law, and all the works of the law as done by us. Thus I have opened the terms of the proposition. Now the two first—to wit, What the sin and the curse is, stand clear in all men’s sight, unless they be atheists, or desperately heretical. I shall therefore in few words, clear the other four. First, justifying righteousness is the doing and suffering of Christ when he was in the world. This is clear, because we are said to be “justified by his obedience” (Rom. 5:19); by his obedience to the law. Hence he is said again to be the end of the law for that very thing—“Christ is the end of the law for righteousness,” etc. (Rom. 10:4). The end, what is that? Why, the requirement or demand of the law. But what is it? Why, righteousness, perfect righteousness (Gal. 3:10). Perfect righteousness, what to do? That the soul concerned might stand spotless in the sight of God (Rev. 1:5). Now this lies only in the doings and sufferings of Christ; for “by his obedience many are made righteous”; wherefore as to this Christ is the end of the law, that being found in that obedience, that becomes to us sufficient for our justification. Hence, we are said to be made righteous by his obedience; yea, and to be washed, purged, and justified by his blood (Heb. 9:14; Rom. 5:18, 19). And again, “Surely, shall one say, in the Lord have I righteousness,” etc. And again, “Of him are ye in Christ Jesus, who is made unto us of God righteousness” (Isa. 45:24, 25; 1 Cor. 1:30). Mark, the righteousness is still “in him,” not “in us”; even then when we are made partakers of the benefit of it, even as the wing and feathers still abide in the hen when the chickens are covered, kept, and warmed thereby. For as my doings, though my children are fed and clothed thereby, are still my doings, not theirs, so the righteousness wherewith we stand just before God from the curse still resides in Christ, not in us. Our sins when laid upon Christ were yet personally ours, not his; so his righteousness when put upon us is yet personally his, not ours. What is it, then? Why, “he was made to be sin for us, who knew no sin; that we might be made the righteousness of God in him” (2 Cor. 5:21). Thirdly, it is therefore of a justifying virtue only by imputation, or as God reckons it to us; even as our sins made the Lord Jesus a sinner—nay, sin, by God’s reckoning of them to him. It is absolutely necessary that this be known of us; for if the understanding be muddy as to this, it is impossible that such should be sound in the faith; also in temptation, that man will be at a loss that looks for a righteousness for justification in himself, when it is to be found nowhere but in Jesus Christ. The apostle, who was his crafts-master as to this, was always “looking to Jesus,” that he “might be found in him” (Phil. 3:6-8), knowing that nowhere else could peace or safety be had. And indeed this is one of the greatest mysteries in the world—namely, that a righteousness that resides with a person in heaven should justify me, a sinner, on earth. Fourthly, therefore the law and the works thereof, as to this must by us be cast away; not only because they here are useless, but also they being retained are a hindrance. That they are useless is evident, for that salvation comes by another name (Acts 4:12). And that they are a hindrance, it is clear, for the very adhering to the law, though it be but a little, or in a little part, prevents justification by the righteousness of Christ (Rom. 9:31, 32). What shall I say? As to this, the moral law is rejected, the ceremonial law is rejected, and man’s righteousness is rejected, for that they are here both weak and unprofitable (Rom. 8:2, 3; Gal. 3:21; Heb. 10:1-12). Now if all these and their works as to our justification are rejected, where but in Christ is righteousness to be found? Thus much, therefore, for the explication of the proposition—namely, that there is no other way for sinners to be justified from the curse of the law in the sight of God than by the imputation of that righteousness long ago performed by, and still residing with, the person of Jesus Christ. First, That men are justified from the curse of the law before God while sinners in themselves. Secondly, That this can be done by no other righteousness than that long ago performed by, and residing with, the person of Jesus Christ. Let us quicken our sluggish souls to conform to Christ. If this was one of the ends of Christ’s coming, to destroy the works of the devil, to deface all Satan’s works, especially his work in me, and to set his own stamp on my soul; how then should I but endeavor to conform! I read but of two ends of Christ’s coming into the world in relation to us; whereof the first was to redeem his people, and the other was to purify his people: “He gave himself for us, that he might redeem its from all iniquity, and purify unto himself a peculiar people, zealous of good works.” The one is the work of his merit, which goeth upwards to the sanctification of his Father; the other is the work of his grace, which goeth downwards to the sanctification of his church: in the one he bestoweth his righteousness on us by imputation, in the other he fashioneth his image in us by renovation; and what, O my soul, wouldst thou destroy the end of Christ’s coming in the flesh? …let us excite our faint, drooping, languishing affections, desires, endeavors. Let us with enlarged industry engage and encourage our backward spirits to fall upon this duty; let us come up higher towards it, or if possibly we may, completely to it; that the same mind, and mouth, and life, may be in us that was in Jesus Christ, that we may be found to walk after Christ, that we may tread in the very prints of the feet of Christ, that we may climb up after him into the same heavenly kingdom; that we may aspire continually towards him, and grow up to him, even to the measure of the stature of the fullness of Christ. 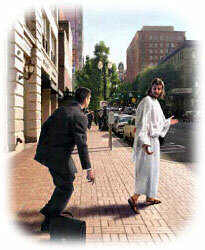 whatsoever action we go about, let us do it by this rule, — would Christ have done this? It is true, some things are expedient and lawful with us, which are not suitable to the person of Christ: “Marriage is honorable with all men, and the bed undefiled,” but it did not benefit his person. Writing of books is commendable with men, because, like Abel, being dead, they may still speak; but it would have been derogatory to the person and office of Christ: for it is his prerogative to be in the midst of the seven golden candlesticks, to be present to all his members; to teach by power, and not by ministry; to write his law in the hearts of his people, and to make them his epistle. …as when I am tempted to sin, then am I to reason thus with myself: would my blessed Savior, if he were upon earth, do thus and thus? If he were to live again, would he live after this manner? Would this be his language? would such speech as this drop from his lips? It may almost seem that David escaped from his crime too easily. We may read the narrative and fail to observe the signs of that deep contrition which such hideous wickedness when once recognized surely must engender. There is the story of the sin drawn in all its shocking details. 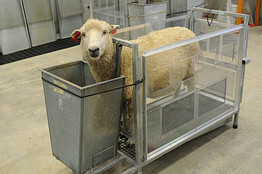 Then Nathan comes in with his beautiful apologue of the ewe-lamb, and its pungent application. And then we read simply: “And David said unto Nathan, I have sinned against The Lord. And Nathan said unto David, The Lord also hath put away thy sin.” After that comes only the story of how the child of sin was smitten, and how David besought the Lord for its life and finally acquiesced in the Divine judgment. One is apt to feel that David was more concerned to escape the consequences of his sin than to yield to the Lord the sacrifices of a broken and a contrite heart. Does it not seem cold to us and external, David’s simple acknowledgment of his sin, and the Lord’s immediate remission of it? We feel the lack of the manifestations of a deeply repentant spirit, and are almost ready, we say, to wonder if David did not escape too easily from the evil he had wrought. It is merely the simplicity of the narrative which is deceiving us in this. The single-hearted writer expects us to read into the bare words of David’s confession, “I have sinned against the Lord,” all the spiritual exercises which those words are fitted to suggest and out of which they should have grown. And if we find it a little difficult to do so, we have only to turn to David’s penitential Psalms, to learn the depths of repentance which wrung this great and sensitive soul. One of them —perhaps the most penetrating portrayal of a truly penitent soul ever cast into human speech—is assigned by its title to just this crisis in his life; and I see no good reason why this assignment need be questioned. The whole body of them sound the depths of the sinful soul’s self-torment and longing for recovery as can be found nowhere else in literature; and taken in sequence present a complete portrayal of the course of repentance in the heart, from its inception in the rueful review of the past and the remorseful biting back of the awakened heart, through its culmination in a true return to God in humble love and trusting confidence, to its issue in the establishment of a new relation of obedience to God and a new richness of grateful service to Him. Accordingly, the conception of the radicalness of the operation required for the Psalmist’s deliverance from sin, is equally developed. No surface remedy will suffice to eradicate a sin which is thus inborn, ingrained in nature itself. Hence the passionate cry: Create—it requires nothing less than a creative act—create me a clean heart— the heart is the totality of the inner life;—and make new within me a constant spirit—a spirit which will no more decline from Thee. 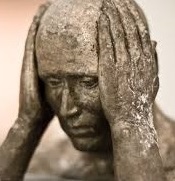 Nothing less than this will suffice—a total re-begetting as the New Testament would put it; an entire making over again can alone suffice to make such an one as the Psalmist knows himself to be—not by virtue of his sins of act which are only the manifestation of what he is by nature, but by virtue of his fundamental character—acceptable to Him who desires truth in the inward part; nay, nothing less than this can secure to him that steadfastness of spirit which will save his overt acts from shame. Is John contradicting himself when he says in one verse that if we say we have no sin, we deceive ourselves (1 John 1:8); and yet he also says the one who is a Christian cannot sin (1 John 3:9; 5:18 NKJV)? There is no contradiction, but to see why we will need to look at the original Greek language. I have bolded the words above that I would like to focus on. In 1 John 3:9, the greek word ποιεῖ (poiei) means to do, to practice. The V3SPAI is shorthand for Verb, 3rd Person Singular, Present, Active, Indicative. Likewise, VPAN means Verb, Present, Active, Indicative. So we see that the word means to do, to practice. But that isn’t all. In Greek, like English, there are verb tenses: past, present, future. But in Greek, the present tense is not quite the same as the English. Instead, it is more a continuous action. Finally, in 1 John 3:9 we see an infinitive form of a verb. The infinitive is “to go,” “to see,” “to eat,” etc. This is important. There is no contradiction. What is happening is that John is saying that the one who is born again does not habitually abide in sin. He may fall into it, but he does not practice it as a lifestyle. The nuances of the Greek language are not carried over to the English; but when we understand what is happening, we then see there is no problem. Finally, any Christian who would say that he does not sin anymore fails to agree with 1 John 1:8 which says, “If we say that we have no sin, we are deceiving ourselves, and the truth is not in us.” He would then be self-deceived.